My teen-aged daughter Maddy and I recently spent an activity filled day in Princeton, New Jersey. Equidistance from New York and Philadelphia, it is well connected to both of these cities via excellent train links that leave you off in the center of town, so it is a good car-free destination. It is only one hour from both, so you are unlikely to hear the dreaded “are we there yet”? In spirit and flavor, this ivy -covered village is the quintessential college town, miles away from urban stress. New Jersey Transit brought us to Princeton Junction, where we caught the charmingly named “Dinky” to Princeton. As we made our way up to the town’s main shopping drag, Nassau Street, we immediately liked what we saw. A good mix of quaint, independently owned shops sit side-by-side with well-known franchises. Princeton Tiger’s sweatshirts rule this part of the world, but pricey boutiques are plentiful. We were wowed by the large and eclectic collection of music at the Princeton Record Exchange (20 South Tulane Street), and for those of us who know what records are, the selection of vinyl is impressive. We were enticed by the interesting selection of bargain-priced books outside of Labyrinth Books (122 Nassau Street), and went inside to explore its large and welcoming space. Maddy browsed the children’s and young adult sections, while I was keen to explore the selection of cookbooks. We crossed Nassau Street and entered the campus of Princeton University thru a hulking iron gate. The Gothic architecture was imposing, but the paths that went all around campus were welcoming and we had fun wandering where we pleased. We were glad that we stopped in to check out the Princeton Chapel. Built in 1928, it is an unusual mix of gargoyles and art deco style stained glass windows. The highlight of our visit was the Princeton University Art Museum. The large collection spans a wide range of time periods. Don’t Miss the colorful Roman mosaic pavements located on the lower level, a feat of painstaking detail and craftsmanship. Maddy was quite taken by the collection of snuff bottles, miniatures that are perfectly sized to appeal to children. Paintings are plentiful in the permanent collection. We were impressed with Monet’s Water Lilies, and the pop art works include Andy Warhol and Roy Lichtenstein’s work. Admission is free, and the collection is quite eclectic, so there is a good chance that some part of it will interest your Children. Our visit lasted several hours, and we left satiated but looking forward to examining the collection more fully on our next visit. The Historical Society of Princeton is located in the 1776 Bainbridge House (158 Nassau Street). We stopped by to look at its museum, which gave us a bit of historical information on both the town and the University’s history. Of the illustrious and lengthy list of famous Princeton students and faculty, none is better represented than Professor Albert Einstein. You can view his music stand and learn about his connection to the town and University. It is well worth a stop, and admission is free. If you want to learn more about Einstein, the Princeton Tour Company offers a wide selection of well-priced walking and biking tours. The Albert Einstein Walking Tour takes you to the home that he lived in for twenty years. They even offer stroller-friendly tours for parents with tots in tow. You won’t leave Princeton hungry. Stand in line with hungry co-eds at PJ’S Pancake House (154 Nassau Street) and you will be rewarded with giant portions of breakfast classics and the chance to mingle with locals and students. The Yankee Doodle Tap Room is located in Princeton’s most historical hotel, the gracious Nassau Inn (Palmer Square). The restaurant is named for its giant Norman Rockwell mural of Yankee Doodle, which hangs over the impressive oak bar. It has a cozy and inviting atmosphere, and the food and service are first rate. We dined on Chilean sea bass, expertly prepared and beautifully served. We had fun looking at the initials that now famous Princeton grads had carved into the wood of the old-fashioned booths when they dined here as students. This stately hotel is the place to stay in Princeton, and it is convenient to all the sites. 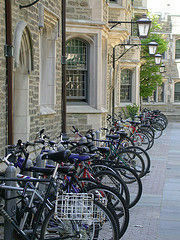 Princeton has no shortage of coffee shops and casual establishments. We enjoyed a snack at Panera’s, our favorite chain restaurant, which is located on Nassau Street. We noticed a good variety of ethnic restaurants, including Indian, Japanese and Mexican. There is quite a lot to do in Princeton, but we really enjoyed strolling the town at a leisurely pace, enjoying its quiet tree-lined streets, great shops and soaking up the collegiate air. Though it was January, the weather was cooperative, with bright sunshine and light breezes. It is a good year-round destination, and we both agreed that it must be lovely under a dusting of snow, or in spring, when trees are green, and students get their bikes out and pedal around town. Whatever season you choose for your visit, this welcoming town will offer you lots of homespun charm and family-oriented fun.